Palermo coach Delio Rossi was not exaggerating when he said earlier this week that Tuesday's Coppa Italia match could be a "historic day for Palermo and Sicily." Palermo's 4-3 aggregate Coppa Italia semi-final win over Milan means that the Rosanero will play the final of the competition after thirty-two years. For the newly-crowned Italian champions, reaching the final would have been di rigueur; for Palermo, as evidenced by their unalloyed joy at the final whistle on Tuesday, reaching the final means the chance to banish an oppressive historical burden. 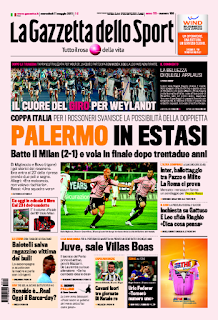 Palermo lost both of the Coppa Italia finals they appeared in during the 1970s--the first to Bologna on penalties in 1974, and the second to Juventus in extra-time in 1979. 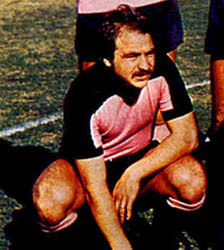 Despite playing in Serie B during the 1970s, Palermo, owned by Renzo Barbera at the time, enjoyed a successful decade. However, those two defeats still remain as bitter memories. The loss in 1979 is particularly painful given how close Palermo came to upsetting a Juventus side that boasted the likes of Dino Zoff, Claudio Gentile, Antonio Cabrini, and Roberto Bettega. On June 20th, 1979, coach Giovanni Trapattoni, who had already won two Scudetti with Juventus by then, led his Bianconeri out at the San Paolo. Within a minute, he saw his side fall a goal behind. Vito Chimenti (the uncle of Antonio Chimenti, who played most recently for Juventus as reserve goalkeeper) surged into the box and sped past Zoff before putting the ball into an empty net. It was a dream start for a club that was still playing its football in Serie B, and for Chimenti, whose sparse hair belied an age of just twenty-five years and bore testament to the rigours of Italian football away from the prominence of Serie A and even Serie B. Chimenti had played his football primarily in Serie C for Lecco, Salernitana, and Matera before coming to Palermo in 1977. Despite Palermo's euphoric start, Juventus responded with a goal from central defender Sergio Brio in the first half, and midfielder Franco Causio in extra-time. Palermo had managed to push Juventus well beyond ninety-minutes, but ultimately they did not have enough to pull off an upset. In the decades following that defeat, Palermo have reached the latter stage of the Coppa Italia only once, and that was during the 1995-6 season, when they were eliminated at the quarter-final stage. Ever since their return to Serie A in 2004, which took twenty-one years, Palermo have consolidated themselves as the challenge from Sicily, especially considering Messina are playing their football in Serie D because of financial troubles, and Catania have finished well below Palermo in recent seasons. Palermo have even managed to play in Europe, and they are guaranteed to again next season. All these achievements have come partly because of and partly despite an impetuous owner in Maurizio Zamparini. Zamparini has often inveighed against the lopsided balance of power in Serie A. Winning the Coppa Italia against Inter on May 29th will be especially gratifying for him not only because it would redress the pain of thirty-two years ago, but also because it would mean victory over one of the establishment. They may not be up against Juventus, but beating Milan and Inter en route to Coppa Italia glory would go a long way to atone for 1979.